If you ever looked back to your line on a pristine powder slope out of breath and surrounded by stirred-up powder snow at the end of a piste, then you know that this was the moment when you became addicted to the fascination of freeriding. Thanks to the snow-reliable location in high altitude, the Kitzsteinhorn attracts freeriders to the glacier in early winter already. The five well-signposted routes are located near the lifts and offer diverse terrain features. From "Ice Age“ to "Jump Run“, freeriders of all ability levels find the ideal terrain for their perfect line. "Safety first!“ – applies to all who are looking for the ultimate powder run away from the secured piste area. The Kitzsteinhorn provides an excellent info system. The Freeride Info Base, centrally located at the Alpincenter, and the Info Points at the entry points of the five routes provide information about the risks in open terrain. Deep-snow skiers are trained for tours in open terrain in special freeride camps and on Freeride Monday, which takes place every week. The five routes X1 "Ice Age“, X2 "Westside Story“, X3 "Left Wing“, X4 "Jump Run“ and X5 "Pipe Line“ are well-signposted. At the entry point of every route are Freeride Info Points providing information about topographical features, levels of difficulty and danger spots of the respective route. "Don't use without avalanche transceiver kit!" and "Safety first!“ also applies to these signposted routes. The two-kilometre-long ICE AGE route starts at the lower terminus of the Glacier Shuttle. The route runs downhill along the summit cable car through the entire corrie with alternating steep slopes and flatter areas and leads downhill to the lower termini of the Sonnenkar cable cars. With its 2.8 kilometres is the WESTSIDE STORY the longest freeride route at the Kitzsteinhorn. This route is also the most western and starts at the upper terminus of the Kristallbahn cable car. Snowboarders need much momentum for the high crossing to get into open terrain – where a vast, snow-white area opens up in front of the freeriders. End point: lower terminus of the Langwiedbahn cable car. The entry point of the LEFT WING is close to the Info Base at the upper termini of the Gletscherjet 2 and Langwiedbahn cable cars. Be careful at the piste crossing after the first short steep slope before continuing in the Langwied powder snow. End point of the X3 is the lower terminus of the Langwiedbahn cable car. Many cliffs and natural kickers for jumps have made the JUMP RUN route very popular with the locals. This route offers a very high fun factor for experts. Starting at the lower section of Piste 12, you cross into open terrain and then get at the Häuslalm to the lower terminus of the Langwiedbahn cable car. The X4 route became famous through the X OVER RIDE event. Short but crisp! The one-kilometre-long PIPE LINE may be the shortest route but the 250 altitude metres offer quite something. The entry point is just below the Info Base. Natural pipes invite to play with the features of the terrain and the mogul piste character of the route gives the thighs a good burning. End point is the lower terminus of the Langwiedbahn cable car. If you dive into deep snow, you leave the secured piste area behind. Don't forget the basic rules of freeriding in open terrain when you surf weightlessly through the finest powder snow or jump over stunning cliffs. 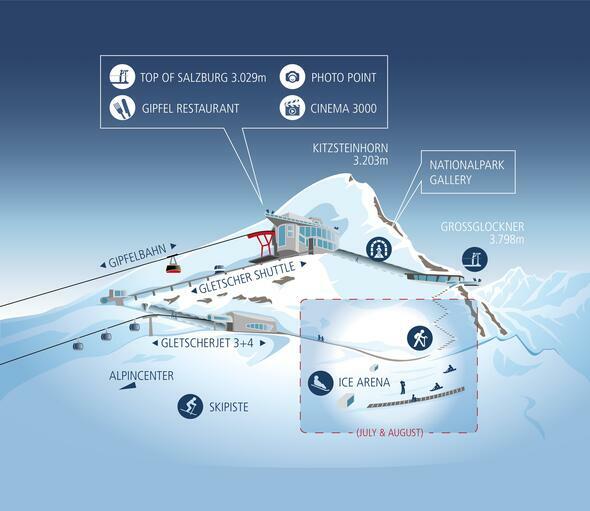 The Info Base and the Freeride Info Points in the Kitzsteinhorn Glacier ski resort provide tips and the dos and don'ts for freeriders, up-to-date avalanche warnings and important equipment information. Bad visibility – a no-go! One-day freeride course for beginners and the advanced arranged by the ski schools of Kaprun. Everything about deep-snow riding, including techniques and safety tips. The local ski schools offer special deep-snow and freeride courses. The necessary skills for freeriding in open terrain and handling the safety equipment is conveyed in these courses. Regular camps and workshops are available in addition.